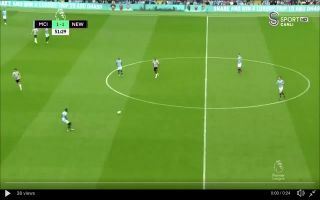 Manchester City full-back Kyle Walker scored a thunderous goal to give City a 2-1 lead against Newcastle this evening in the Premier League showdown. In the 52nd minute of the Premier League fixture Walker scored a rocket to send City into the lead after Sergio Aguero teed the ball up for the England international. Walker’s thunderbolt was his first of this season and a goal so early in the campaign for the former Spurs man signals his intent to dominant this season once again – reiterating that the 28-year-old is one of the best full-backs in world football right now.